I recently attended the 'Investiture at Windsor Castle' for my father's knighthood for over 30 years of political service. Each person receiving an honour is allowed to invite up to three guests. It was a fine October day, with the early morning mist still shrouding Windsor Great Park as the line of cars of people receiving awards began queuing up from around 9.15 am along the great avenue that stretches before Windsor Castle. Most of the cars (certainly my father's silver 4 x 4, which was uncharacteristically mud-free) showed evidence of having been through a car wash and wheels polished. Likewise the formal shoes of all honourees were all shined, brushed and glistening like a Guard's officer or a Dowager Countess (of which more later). Many shoes, bags and indeed outfits looked new. An Investiture - there are around 27 a year, split between Buckingham Palace, Windsor Castle and one at the Palace of Holyroodhouse - is not the time to let your sartorial standards slide. Nobody wants to be remembered by the 100 plus audience of family and friends - like a Bateman cartoon - for having a mother of pearl button missing from your morning waistcoat. The orange printed invitation card issued to each guest by the Lord Chamberlain stated 'Entry from 10 O' Clock'. Since almost everybody was cautiously early, a police officer walked along the row of cars (resembling the queue to get into Car Park 1 at Royal Ascot) and said it was fine to go off and have a coffee and 'stroll around' in Windsor. Once we were inside the castle gates, the first thing I noticed were Her Majesty's lawns. Never have I seen lawns so immaculate, edges so manicured, stripes so regimental and grass so glossy, Forest-of-Arden green. Thinking of my bumpy mole hills and un-scarified lawns at home in the country made me realise how a well presented English lawn is one of our nation's great contributions to civilisation. Windsor Castle's lawns make Wimbledon centre court or the Lords cricket square suddenly resemble a municipal dog-park. We were handed smart navy blue Investiture booklets, listing all those receiving honours and the selection of music like a wedding order of service. The ceremony was in the Waterloo Chamber, a magnificent room decorated with a series of 25 famous paintings by Thomas Lawrence celebrating victory at Waterloo in 1815. 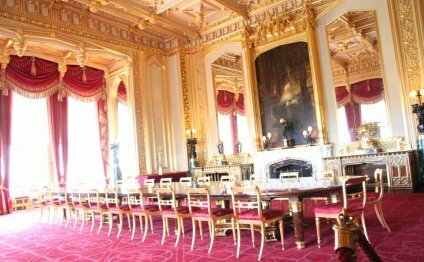 Family members and guests sit in the main chamber whilst those receiving honours wait in another room waiting for their moment to be 'presented'. Once you receive your award, you then take a seat at the back - clutching your award - of the Waterloo Chamber. I was sitting on the end of an empty row in an aisle seat near the back which meant I had a clear view down the main aisle of all proceedings. It all felt quite overwhelming. A royal trumpet sounded followed by the National Anthem played by a string orchestra (conducted by Major Philip Stredwick of the Corps of Army Music) assembled in a minstrel's gallery at the back of the state chamber. The Queen then entered attended by two Gurkha officers - a tradition going back to 1876 by Queen Victoria - and escorted by either the Lord Chamberlain, the Lord Steward or a Lord in Waiting who then stands to the Her Majesty's right and announces the name and 'achievement' for which they are being decorated. The first up receive their award was Dame Maggie Smith who received The Companion of Honour. The next thing I knew she was sitting next to me as the empty row of seats began filling up with honourees clutching their decorations. Several thoughts floated through my head as I sat in a semi-surreal state waiting for my father's turn. Inside Edge, Wishing Well. At The Windsor Castle. Who lives in Windsor castle? Where are the Crown Jewels in London?